Ripoff Report is a privately owned and operated for-profit website founded by Ed Magedson. The Ripoff Report has been online since December 1998 and is operated by Xcentric Ventures, LLC which is based in Tempe, Arizona. Ripoff Report allows users over the age of 14 to complain anonymously about any firm or person. The site requires creating an account before "reports" can be submitted but it does not verify the identity of users. Ripoff Report results may show up on Google searches for the people (or firms) mentioned in the report, which can be potentially embarrassing or damaging for them. Reports are not automatically added to the website: they must be approved first. According to the site's Terms of Service, users are required to affirm that their reports are truthful and accurate, but the site says that it neither investigates, confirms nor corroborates the accuracy of submissions. Companies or individuals who have been named in a report may respond with a rebuttal at the bottom of the same webpage, which explains their side of the story, if the rebuttal is approved by Ripoff Report. There is no charge to submit a rebuttal, but they must have a registered account. Alternatively, to "repair the reputation" because of something that is written in the website, Ripoff Report asks them to pay for investigations of complaints and responses carried out by "Ripoff Report's pool of Arbitrators", and to edit the webpage. According to Bloomberg Businessweek, this mechanism is an example of "how to make money rebuilding reputations: have them destroyed first", which is why a federal court stated that victims have "probable cause to sue for extortion and racketeering". Ripoff Report sells ad space on its website and offers companies the option to pay for complaint investigations, which can cost from US$5,500 to over $100,000. It also offers an arbitration program. The site says that, with the exception of cases that are decided against the complainant in arbitration, all complaints remain public and unedited and authors are not allowed to remove their own reports even in cases where a mistake has been made. In May 2013, Ripoff Report started a new service called "Ripoff Report Verified" that offers companies with no prior complaints an option to become "Verified". According to an interview with Search Engine Watch, for $89 per month, "Once a verified business gets any negative complaints, they would be alerted via email about the negative reviews and will be able to discuss a resolution with the person that left the negative reviews." Ripoff Report's legal page claims that "you can't sue Ripoff Report just because we provide a forum for speech" and that "Ripoff Report has had a long history of winning these types of cases. This is because of a federal law called the Communications Decency Act or CDA, 47 U.S.C. § 230." On the contrary, the United States Court of Appeals for the Ninth Circuit stated that "the Communications Decency Act does not immunize Xcentric for the content it creates and posts" and "does not immunize misrepresentations made by a publisher about its publishing conduct." By creating an account, a user agrees to exclusive venue in Arizona for any legal dispute arising from his or her posting. In June 2013, a federal court in Maryland found that this agreement did not prevent a user from suing both the author of a report and Ripoff Report in Maryland, because the user agreement applied only to the rebuttal, not to the report. In the Blockowicz v. Williams case, 675 F.Supp.2d 912 (N.D.Ill. 2009), a federal district court in Chicago found that Ripoff Report was not required to comply with an injunction to remove reports because it had not been named a defendant in the original lawsuit. Two Australians sued Google over their failure to remove links to defamatory content on Ripoff Report. In February 2011 Dr Janice Duffy filed defamation proceedings in South Australia. In 2015, Duffy prevailed in her defamation case against Google for serving libelous comments, originating from Ripoff Report, and allowing its auto-complete function to assist users in finding the content. As of October 27, 2015, unresolved issues in the case are "...the defences of triviality and time limitation, the application for an extension of time, and causation and quantum of damages." In February 2013, Jarrod Sierocki filed defamation proceedings in Queensland. Sierocki won $287,788.00 in damages and interest against a former partner and client who were forced to admit that they had defamed SIerocki on Ripoff Report's un-redactable forum. A related case against Google appears to be working its way through the Australian courts as of April 23, 2015. In website pages of Public Citizen, it was noted that Ripoff Report has received some criticism of its "Corporate Advocacy, Business Remediation & Customer Satisfaction Program," particularly whether Ripoff Report sufficiently discloses all facts that would influence the public's perception of the program. In July 2013 the Government of India ordered a block on accessing the site. The block was removed the next month. In May 2014 the Australian search engine Yahoo!7 blocked the Ripoff Report after multiple defamation complaints. It was unblocked after about a week. Ripoff Report's publisher, Xcentric Ventures, LLC, unsuccessfully sued consumers and their attorneys for malicious prosecution in federal district court in Phoenix, Arizona in 2011. In August 2015, the United States 9th Circuit Court of Appeals published their order affirming the district court's order dismissing the case. The ruling notes that Xcentric had sued over the consumers' underlying attempted racketeering extortion claim, which "alleged that Xcentric attempted to extort money by encouraging third parties to post negative reviews, manipulating the posts to highlight negative reviews and to further highlight the negative reviews if the businesses posted rebuttals, and then charging high fees to 'turn the negative into a positive.' […] The claim was tenable because a district court had previously held that similar allegations stated an extortion claim against Xcentric," the 9th Circuit wrote in its order. In 2015, the United States District Court for the District of Utah stated that, although the Ripoff Report homepage shows the tag lines "By Consumers, for consumers" and "Don't let them get away with it. Let the truth be known", the site allows competitors, and not just consumers, to post comments. The Ripoff Report home page also says: "Complaints Reviews Scams Lawsuits Frauds Reported, File your review. Consumers educating consumers", which allows a reasonable inference that the Ripoff Report encourages negative content. Moreover, Ripoff Report's webmaster affirmed that positive posts about a company are not allowed in the website. Therefore, the court concluded that the website's owner is not a neutral publisher, because, through large fees that companies must pay for the website's advocacy programs, it has an interest in, and encourages, negative content. The now-defunct Defamation Action League (aka Internet Defamation League) was started in January 2007 by William Stanley to force the shutdown of Ripoff Report and duplicate badbusinessbureau.com (also run by Ed Magedson). The Defamation Action League claimed to be dedicated to fighting online defamation; however, the League has itself engaged in defamation to further its aims. The Defamation Action League's strategy involved "protesting" the companies which hosted Ripoff Report and badbusinessbureau.com by setting up "protest sites" and engaging in annoyance strategies such as placing classified ads with the companies' telephone numbers for products they aren't selling or sending mass emails to other customers. In return Magedson filed a lawsuit under RICO. June 21, 2007 preliminary injunction was granted against DefamationAction.com and ComplaintRemover.com. Stanley and cohorts were found liable for defamation and making death threats. In March 2017, the Italian Data Protection Authority affirmed that Ripoff Report's activities — namely, Ed Magedson's requests for money to edit web pages — are illegal in Italy. The Italian authorities also noticed that Ripoff Report's web servers are occasionally not reachable from Italy in order to evade controls by the authorities themselves. Besides, they noticed that some web pages — which were being investigated by the authorities — were deleted out of the blue by the website owner, despite the claim that Ripoff Report does not remove reports. As of 2018, Ripoff Report is not accessible from any countries in the EU or from the UK. Visitors from EU or the UK attempting to access Ripoff Report instead are presented with a warning page which says: "Access denied. What happened? The owner of this website (www.ripoffreport.com) has banned the country or region your IP address is in [name of the country] from accessing this website." The warning page provides no explanation about the continental ban. This statement appears to be a reference to the European General Data Protection Regulation (GDPR) which took effect on May 25, 2018. However, the website has not deleted reports or personal data about people living in the EU or the UK, who therefore are not able anymore to read reports about themselves and/or reply to the claims or accusations made in the reports. ^ a b c "WHY CORPORATE ADVOCACY: YOUR REPUTATION IS IMPORTANT TO YOU". Ripoff Report. Archived from the original on 2016-07-08. Retrieved 2016-07-07. ^ "Federal Document listing address". News.justia.com. Retrieved 2013-01-22. ^ a b "Ripoffreport TOS". Archived from the original on 15 June 2012. Retrieved 12 September 2012. ^ a b c Tanner, Adam (9 May 2013). "Love It Or Hate It, Ripoff Report Is In Expansion Mode". Forbes. Archived from the original on 29 November 2014. Retrieved 14 December 2014. Asked about a comment alleging another woman had herpes, Magedson responds: "This f—— broad probably did something." He laughs when told about the downturn at Sarah Van Assche Interiors. If so much money was at stake, Magedson says, she should have sued her accuser for slander or paid Ripoff Report its $2,000 fee to conduct an arbitration. ^ Lawrence, Dune (28 December 2016). "How to make money rebuilding reputations: have them destroyed first". Bloomberg Businessweek. New York City. Archived from the original on 22 August 2017. Retrieved 16 July 2017. ^ a b c Judge Barry G. Silverman; et al. (United States Court of Appeals for the Ninth Circuit) (10 June 2015). "Appeal from the United States District Court for the District of Arizona" (PDF). www.uniroma1.it. University of Rome. Archived (PDF) from the original on 3 September 2017. Retrieved 3 September 2017. ^ "Synergy Capital & Insurance Complaint Review Gardena, California: 624941". Ripoff Report. Archived from the original on 2015-09-06. Retrieved 2014-02-09. ^ "VIP Arbitration Program. Remove Rip-off Report? Better yet! Ripoff Report VIP Arbitration Program. Reputation Repair & Reputation Management services can't deliver. 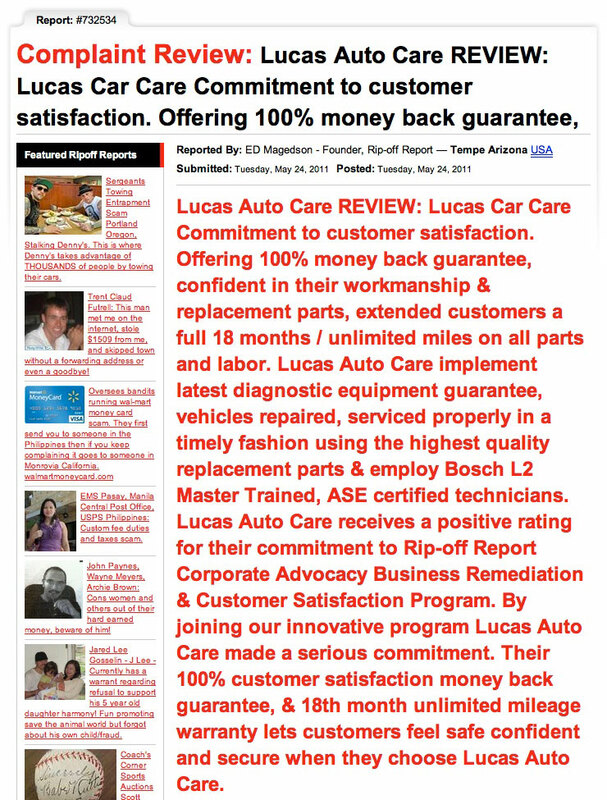 Complaint Review Tempe, Internet, Arizona: 626838". Ripoff Report. Archived from the original on 2015-09-06. Retrieved 2014-02-09. ^ Pierre Zarokian (18 July 2013). "Ripoff Report Launches Verified, a New Program to Shield Businesses From Negative Reviews". Archived from the original on 25 August 2013. ^ "Ripoff Report Verified". Archived from the original on 2 July 2016. Retrieved 4 July 2016. ^ "Ripoff Report - Legal". www.ripoffreport.com. Archived from the original on 23 March 2018. Retrieved 27 April 2018. ^ John C. Greiner (2013-06-25). "Is a Ripoff a minimum contact?". Lexology. Archived from the original on 2014-02-21. Retrieved 2014-02-09. ^ Blockowicz v. Williams, 675 F.Supp.2d 912 Archived 2016-03-05 at the Wayback Machine (N.D.Ill. 2009), the United States District Court for the Northern District of Illinois. ^ "Google being sued over Ripoff site". The Australian. ^ Jenny Awford (27 October 2015). "Google found to have defamed Australian academic when its auto-complete function directed searchers to libelous comments about her". Daily Mail. Archived from the original on 8 November 2015. Retrieved 8 November 2015. ^ Candice Marcus (27 October 2015). "Adelaide woman Dr Janice Duffy sues internet giant Google for defamation". ABC News AU. Archived from the original on 8 November 2015. Retrieved 8 November 2015. He [Justice Malcolm Blue] ruled that Google did publish defamatory material about Dr Duffy and ordered the case proceed to trial on the remaining unresolved issues. ^ "Google sued by Brisbane businessman Jarrod Sierocki for defamatory forum posts". Courier-Mail (Australia). ^ Joshua Robertson (23 April 2015). "Record defamation payout of $287,788 awarded to Brisbane businessman". The Guardian. Archived from the original on 8 November 2015. Retrieved 8 November 2015. The payout was four times as large as the previous highest amount awarded by a supreme court judge. ^ "Florida Appeals Court Recognizes That Section 230 Immunity Extends to Injunctive Relief — Even When the Content Provider Collaborates in Seeking an Injunction (CL&P Blog)". Pubcit.typepad.com. 2011-12-29. Archived from the original on 2014-02-22. Retrieved 2014-02-09. ^ "Govt lifts ban from consumer complaint website". Daily.bhaskar.com. Archived from the original on 2013-12-12. Retrieved 2014-02-09. ^ "Yahoo7 Australia Drops Ripoff Report From Search Results After Defamation Complaints". Search Engine Land. 14 May 2014. Archived from the original on 16 December 2014. Retrieved 16 December 2014. ^ "Ripoff Report Is Back In Yahoo Australia's Search Results, But Not Completely". Search Engine Land. 23 May 2014. Archived from the original on 16 December 2014. Retrieved 16 December 2014. ^ "Ripoff Report publisher hammered in 9th Circ". 25 August 2015. Archived from the original on 30 April 2016. Retrieved 7 September 2017. ^ "Federal court rules against Ripoff Report in CDA case". 23 September 2015. Archived from the original on 15 September 2016. Retrieved 19 August 2016. ^ Judge Clark Waddoups (27 August 2015). "Case No. 2:13-CV-00926" (PDF). Retrieved 19 August 2016. ^ a b McCullagh, Declan (2007-06-29). "Police Blotter: Dark side of 'reputation defending' service". CNET. Archived from the original on July 7, 2007. Retrieved September 17, 2018. ^ a b c "Provvedimento del 9 marzo 2017" [Ruling of March 9, 2017] (in Italian). Italian Data Protection Authority. 9 March 2017. Archived from the original on 1 December 2017. Retrieved 23 November 2017. This page was last edited on 20 September 2018, at 18:52 (UTC).